When the son of Melissa Marks and Vicente Caride got too old not to have a door on his bedroom, they decided it was time to make some renovations to their New York loft apartment. So they called in I-Beam Design for help, and together with LEGO artist Sean Kenney, they built a new stair railing and wall out of 20,000 LEGO bricks. Colorful, flexible, and very fun, this renovated space beautifully showcases everyone's favorite building block. Using mostly primary colors, the kid’s room is minimal and playful. I-Beam designed the 20,000 LEGO blocks staircase, while artist Sean Kenney worked with the family to create a pleasant flow of receding or intensifying color up and down the stairs. The apartment’s color palette offers a soft background for the LEGO-inspired touches of colors and the iconic furniture — like the Barcelona Chair — placed throughout the space. The stark kitchen was made using another Nordic classic, IKEA cabinets, and features splashes of colors like the Blu Dot red chairs and shiny blue backdrop. Sliding walls also serve as exhibition walls to reveal or conceal different areas of the house, like the modern looking dinning room. 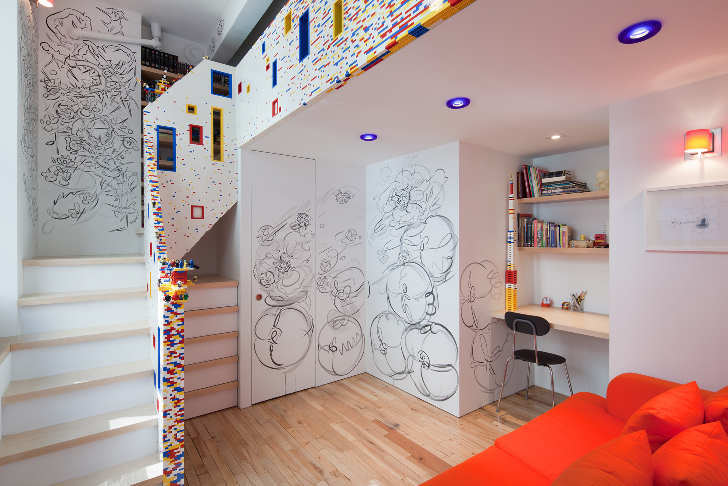 Playful, colorful, modern and very arty, this wonderful New York apartment shows that LEGOs are good for much more than child’s play. I-Beam designed the 20,000 LEGO blocks staircase, while artist Sean Kenney worked with the family to create a pleasant flow of receding or intensifying color up and down the stairs. The apartment's color palette offers a soft background for the LEGO-inspired touches of colors and the iconic furniture placed throughout the space. The modern kitchen was made using another Nordic classic, IKEA cabinets, and features some splashes of colors, like the Blu Dot red chairs and shiny blue backdrop. Sliding walls also serve as exhibition walls to reveal or conceal different areas of the house, like the modern looking dinning room.